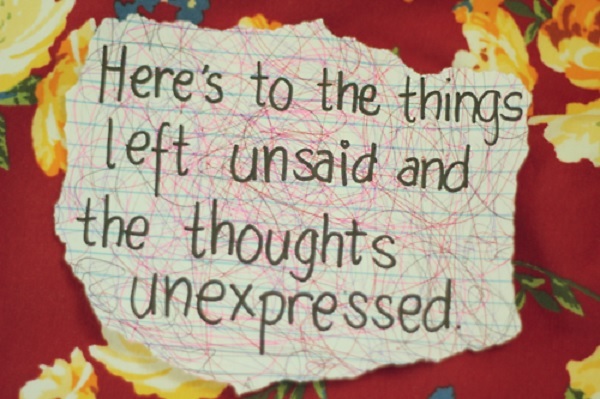 Things Unsaid and Thoughts Unexpressed. It’s awkward to write anything about death, even when it has happened. It just feels off. Maybe because it’s a loss that you cannot redeem despite how hard you pray or work. Lazarus was a lucky man to get a second chance at living. Then again, we’re mortal and death happens. It’s a phenomenon that’s happens every single day, hour, minute. As I type this, something is happening to someone that’s taking away their life, the core of their being. That’s scary. Actually what scares me, is not the dying in itself, it’s the process of it. The how and the what. The how. Experiencing the feeling of not being able to breathe or if there’s a pain that comes with it (I believe no one wants to experience immense pain, I mean unless it’s a crazy fetish). The what. The people who care about me suffering emotionally. I think emotional pain is to some extent more daunting that physical pain. When I was a kid, I feared any mention of death, but for some reason I still used to read the obituaries page in the dailies. My mum is a nurse, and I think with the profession and the exposure it brings, comes the acceptance of this phenomenon. I remember her joking about reading the obituary, saying, “It’s good to read it just in case someone mistakenly puts you there and you’re here”. It was kind of funny, now that I think of it, but then, not. Or when she said something about when she’s not there, how she’d like things to be done, that we don’t have to spend an arm and a leg, or she shares her passwords just in case of anything. Oh my, that completely freaked me out. Like let’s just leave it there, let’s not talk about it. In essence, there should be nothing wrong with discussing about it, because it’s part of our existence. I don’t know how I would deal with the absence of any of my loved ones, or even people I generally interact with a lot. And I really don’t want to know or imagine it. Have you ever been told to write your eulogy and the first thing that crossed your mind, is that the person is telling you to write your death wish? I doubt I did that assignment or I chose another composition to write. At least we were given a choice. Anyhow, why I thought of this? I just realized that when a young person dies, especially one that is known within my circle of friends even if I don’t know them, I get curious, really curious. I want to know a little more about them, I want to know what happened, I want to know what they used to do and so on. Then I wonder, why the curiosity after someone’s death? Why not be curious before. Although before, you probably didn’t know much about them, just a mention here or a picture there. Everything is magnified then; how happy or nice a person used to be, how successful they were, how they were a force to reckon with, how they’d done this and that, how people looked up to them and loved the things they did for them and for others. Chances are that this person didn’t even know these things about themselves, they didn’t know that that’s what people thought about them. Maybe they thought less of themselves, or they were lonely and alone. Of things unsaid and thoughts unexpressed. For some reason when death happens, you are more alive in people than you were when you were alive. I think for me that’s the scariest part. But in my opinion, I wish that’s not how it was. Maybe the change starts from me and you and that’s why I really admire what Humans of New York does. It makes everyone relevant, even when to others, they don’t seem so. Every time they post a picture with such real and personal captions, it touches my heart.